Do you struggle with choosing what to cook each night? “The hardest problem for me has been simply choosing what to cook. “I took the plunge with Soupstones meal planning when I realized that for the past year I’ve been planning our weekly meals with Jules’ free e-cookbook and “The Tired & Hungry Cook’s Companion”, so why shouldn’t I just have the planning done for me with these same delicious meals and ingredients?! So now Jules does the planning for me. I cook about 3 meals per week and they are always fabulous. I’ve always been skeptical about paying for meal plans, but when you love the recipes you’re getting from one source. And it’s food you like to cook (yes 5 – 6 ingredients!) and eat, then it makes all of the sense. Tired of choosing what to cook? 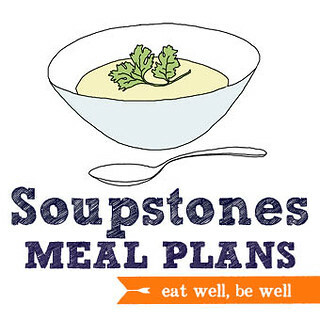 If you need help to simplify your planning and cooking, then check out Soupstones Meal Plans.